Defenseman Jake Muzzin has been cleared to play and is likely to see his first action since sustaining an upper-body injury during the preseason when the Los Angeles Kings host the Buffalo Sabres on Thursday, according to Jon Rosen of lakingsinsider.com. While Muzzin should be owned in most leagues, fantasy owners tend to be impatient early in the season. As a result, he's only owned in 37 percent of leagues. That's way too low considering how many games are left to play and how impressive he has been to this point in his NHL career. Muzzin, who had six goals, six assists and 48 shots on goal in 26 games in the 2014 Stanley Cup Playoffs for the Stanley Cup champion Kings, returns after missing their first six games. And boy could their offense use another source of scoring from the blue line. The Kings were brilliant from a goal-scoring standpoint in each of the two postseasons in which they went on to win the Stanley Cup, but their offense in those preceding regular seasons was a much different story (2.29 goals per game in 2011-12, 29th in NHL; 2.42 goals per game in 2013-14, 26th). Through six games this season, Los Angeles has followed a similar trend (2.33, 24th). 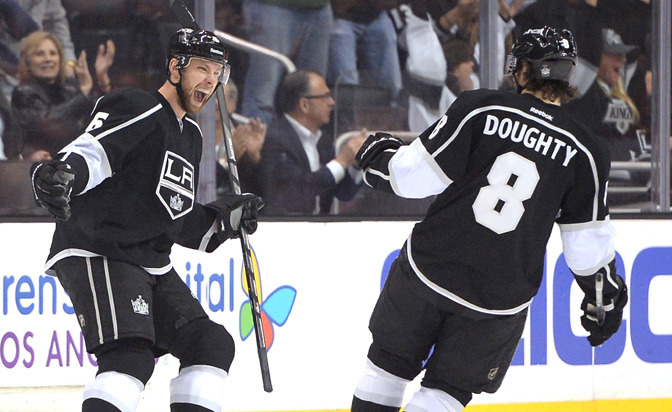 Marian Gaborik is sidelined, and offensive anchors Anze Kopitar and Drew Doughty have two points apiece. Eleven of the Kings 14 goals this season have been scored by their second line of Tanner Pearson, Jeff Carter and Tyler Toffoli. Muzzin's return is bound to help the Kings cause. Playing with Doughty on Los Angeles' top defensive pairing, Muzzin generates shots on goal at a high rate (175 in 76 games last season), and will see his Yahoo ownership skyrocket to the 70 or 80-percent range if he gets more puck luck than he did last regular season (five goals on 2.9 percent shooting). With Slava Voynov suspended indefinitely, the team will rely on Muzzin, 25, to log 20-plus minutes per night with 2:30-3:00 on the power play. Muzzin produced five points with the man advantage during the 2013-14 season in 2:24 of power-play ice time per game, but took it up a notch with six power-play points in the postseason. One of my preseason fantasy sleeper candidates, Muzzin somehow remains under the radar despite his well-documented success on the big stage in the playoffs. Considering his added value in leagues that count plus-minus (plus-8 last season), penalty minutes (58) and/or hits (169), there's every reason to add him. If you're looking for a replacement option for Victor Hedman, who has been placed on injured reserve in Yahoo formats, there's your answer. If Muzzin is owned in your league, an alternative option is veteran New York Islanders defenseman Lubomir Visnovsky (7 percent owned), who is also expected to return from injury Thursday.